We live in a time when mobile devices have become the de-facto of everyday life. Most of us check our phone several times a day, be it to check messages, send emails, surf the net, or call someone. Some of us watch movies on our tablets or read e-books on our e-reader while on the go. For others, we may be texting for as long as hours a day! According to Hansraj’s results, the force exerted on our spine dramatically increases when our head flexes forced. 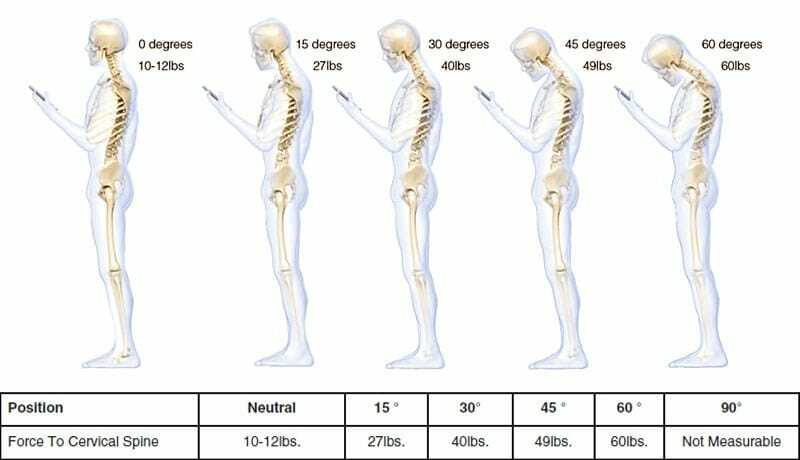 It goes from 10 to 12 pounds in the neutral position (that’s the weight of an average adult human head), to 27 lbs / 12 kg at 15 degrees, to 40 lbs / 18 kg at 30 degrees, to 49 lbs / 22 kg at 45 degrees and 60 lbs / 27 kg at 60 degrees! 60 lbs — that’s five to six times the usual force on our neck at a neutral position — that isn’t light by any means, and is the equivalent weight of a boxer dog, a punching bag, or an arm chair!! Now this data probably wouldn’t be as alarming if not combined with the fact that many of us spend long periods of time, easily at least two hours a day on phones, tablets, and e-readers. (Americans clocks nearly three hours a day on mobile phones alone, and I’m sure it’s longer for some of us.) Assuming two hours a day, that adds up to at least 700 hours a year, meaning at least 700 hours of additional stress to our spine a year each year! I don’t know about you, but good health is important to me, and this includes good spinal health. With back pain affecting 8 out of 10 people at some point in their lives and spinal problems starting as early as age 29, it’s important that we don’t take our spinal health for granted. When using your phone, hold it up to chin level, as opposed to your chest or waist level. Putting it at your chest or waist level forces you to push your neck down and forward, which is where bad posture begins. If you have a tablet, use a tablet stand so you don’t hunch over as much when using it. Prop it up on a table of good height (not too low that you have to slouch). Just because your device is not in front of your face doesn’t mean you need to tilt your head completely to read it. Your eyes have a range of motion, so use that (and minimal tilting) to read your device. Increasing the default font size, particularly for SMS, Whatsapp, email, browser, and e-reader, since that’s where most reading take place. You should be able to do this in “Settings” menu. Use the zoom function. This should be available in web browsers, email, and PDF readers. Increase the brightness and/or contrast if you constantly peer due to a dim screen. Take regular breaks from phone/computer; don’t spend hours hunched over. To keep the joints in your neck limber, move your head from left to right several times and touch your ear to your shoulder on both sides. Place your hands on your head to provide some resistance as you push your head forward, and do the same as your push your head back. This strengthens the ligaments and muscles that support your neck.